For title. frame: Scientific and educational conference "The people - the source of power: from the vocation of Rurik to Internet democracy." Speaker: Alexei S. Puchnin, Chairman of the St. Petersburg Election Commission. Duration: 13 minutes 32 seconds. I. "The people - the source of power: from the vocation of Rurik to Internet democracy," the scientific and educational conference (St. Petersburg, 2012). II. The Boris Yeltsin Presidential Library (St. Petersburg). Expert Department. "The people - the source of power: from the vocation of Rurik to Internet democracy," the scientific and educational conference (St. Petersburg, city, 2012) - Multimedia publications. 2. Power (collection). 3. The people (the collection). 4. Electoral system in Russia: history and modernity (collection). 5. 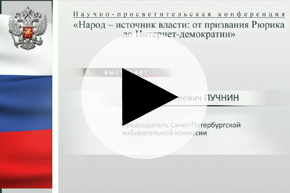 Electoral system - Russian Federation - Multimedia publications. 6. Russian Federation - Politics and Management - Multimedia publications.